Corporate flyers deserve great deals, including low rates on long-term parking when they’re flying in and out of Newark Liberty International Airport (EWR). At SNAP, we offer specialized corporate parking programs and offers for businesses whose employees regularly use Newark airport. Our goal is to be the number 1 corporate parking for all your Newark airport needs. Contact us today by filling out an online form. One of our professional corporate parking representatives will get back to you to create a plan that’s ideal for your long-term corporate parking needs. Security. Our large, gated facility is monitored 24/7 using state-of-the-art equipment such as more than 100 CCTVs. Plus, we have people on staff round-the-clock. It doesn’t matter if it’s the middle of the day or the wee hours of the night: Someone will be at SNAP to serve you and your colleagues. Convenience. We strive to make traveling as convenient as we can for all our customers. This starts with white glove valet service. When your employees drive up to our facility, a professional valet will take the keys and park the car. From that point, travelers can take our free shuttle to Newark airport, which takes about five minutes thanks to our nearby location. Low Rates. SNAP’s rates are already low, but with a corporate plan, you’ll enjoy access to even greater discounts and deals. Our corporate customers are some of the first to get coupons and exclusive offers that aren’t available to the general public. This provides you with insider opportunities. Covered Parking. Have a fleet of corporate vehicles that you want to keep out of the elements when not in use? Our covered parking facility is the solution. We are the only 100 percent indoor* parking garage serving the Newark airport. No matter what happens with the weather, your company and employee vehicles will be protected. When you sign up as a corporate customer with SNAP, you’ll get the advantage of being able to earn points through our SNAP Pass program. Each of your employees who uses SNAP will be given a SNAP Pass card and membership number. Every time they park, points will begin to accrue. Those points can be used later for a variety of services at our facility, including car washes, vehicle detailing, oil changes and much more. It’s a great way to ensure all the vehicles stored safely in our parking facility will come out looking even better than they did when you brought them here! 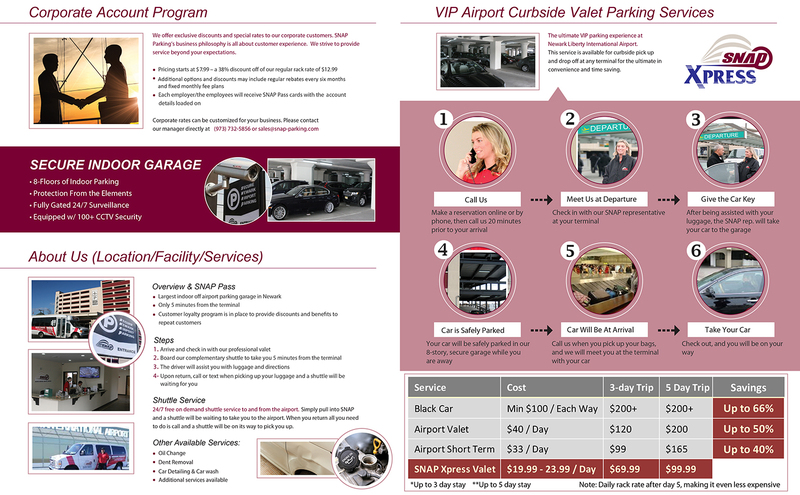 Start getting the most value out of your Newark airport parking experiences. Contact us through our online form to learn more about setting up a corporate account with SNAP. If your employees are constantly traveling, we would love to hear from you. We will work with you to give them peace of mind knowing that their car is protected in our indoor parking garage.